Art of balance, or not? 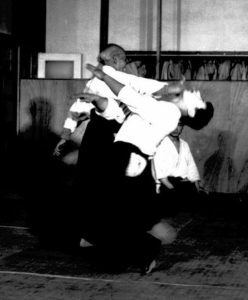 Let’s take some time to consider the term Kuzushi, or balance breaking and its role in Aikido. 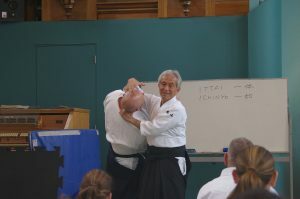 Many people have come through a background in Judo where this term is very prevalent, as it is in Tomiki Aikido, it is also a term I have heard used frequently in Yoshinkan Aikido. This is actually quite a tricky topic to discuss, as the application of Aikido technique would fail if the state of balance of the opponent was not disturbed, it brings me back to that old bugbear that I have, which is that intent to do anything to your partner creates within you the same exact mindset. Two people intent on doing something to each other is not the ultimate goal of Budo, and Maruyama Sensei would say this is actually competition or sport, and is not Budo at all. To understand this principle a little better, let’s take a look at the process of what creates balance. First we have the structure and its centre of gravity and muscular support system. At its most base level, Kuzushi is the disrupting of this structure through physical contact. Leading or manipulating your opponent outside their centre of gravity, displacing the structure of the spinal column or leverage through joint manipulation have all proven to be technically effective. But we are only talking about structure. In actual fact, balance is the job of the inner ear and the signals it sends to the brain. 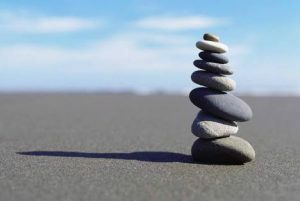 You could actually say that balance starts and ends in the mind. I would go as far as to say that, if the attackers mind is disturbed, you have the most effective form of Kuzushi. Imagine yourself, you are walking down a slippery slope, trip and stumble downhill. There is a tree in front of you, it has a branch sticking out and it is within your grasp. Two things are happening here. Firstly your brain, in its usually precognitive state is about a few seconds ahead of your motion, it’s at the tree, and it is expecting resistance to arrest its fall. Secondly, there is expectation, of what and how things will happen, of the effect on your fall the resistance will have. But the branch breaks. The mind is broken, and all expectation gone – the mind falters. It is this moment that in Yuishinkai Aikido as in true Budo, that Kuzushi happens. It’s not about doing to others, it’s about them doing it to themselves. When you change yourself you can change others, by influence, not intent. We need to learn to become invisible to the attacker, unknowingly connected, stuck to their hara, not there extremities. A Subtle presence through relaxation, moving ourselves in space and time. Be where they intended to be, cut centre with centre. Don’t avoid engage. These are principles of true Budo, of true Kuzushi. The name of our Aikido school should be the clue. Yuishinkai is the school of the study of the essence of mind. The study of and understanding of not only your mind, but the mind of the attacker as well. “O’sensei was not off-balancing. He could hold you in such a balance that you did not have any other way to move.”. http://www.aikidoyuishinkaiaustralia.com.au/wp-content/uploads/2016/03/Aikido-Yuishinkai-Australia-Logo-4.png 0 0 PeterK http://www.aikidoyuishinkaiaustralia.com.au/wp-content/uploads/2016/03/Aikido-Yuishinkai-Australia-Logo-4.png PeterK2016-08-19 06:22:282016-09-02 00:41:42Art of balance, or not? Find your own Aikido Shinken shobu, Aikido’s Great Battle…..